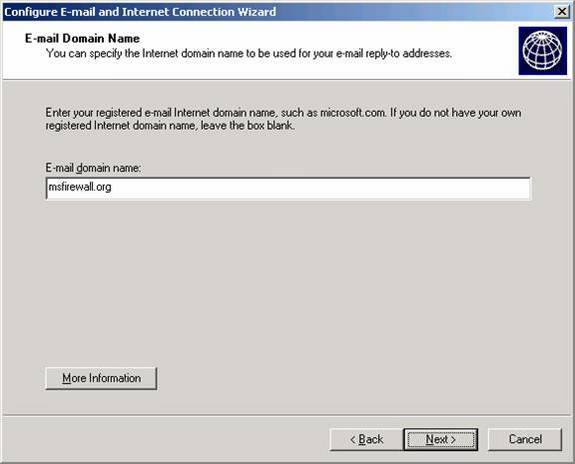 The e-mail domain page is where you specify the domain name that users will use when sending mail to your Exchange Server. For example, suppose you pick the Internet domain name, msfirewall.org. When a user on the Internet sends a message to [email protected], the user’s e-mail client application sends the SMTP message to his SMTP server. His SMTP server then does DNS queries to determine the address of the e-mail server responsible for the msfirewall.org domain. After resolving the msfirewall.org MX domain name to an IP address, the user’s SMTP server then sends the messages to the msfirewall.org’s mail server. You must register this domain name with a domain registrar before it will work. However, that isn’t the end of the process. After registering the domain name, you must have a DNS provider that can house the zone file authoritative for your domain. You also have the option to host your public DNS server yourself, but this isn’t a good idea for an SBS single server deployment, because you never want to mix your public domain records with your private domain records. Of course, if you are using different domain names for public and private access, then you could create a second DNS zone on your SBS computer’s DNS server and this would allow you to act as the authoritative DNS server for both your internal and external domains. For a SBS environment, I recommend that you have someone else host your DNS records, because DNS implementations should be highly fault tolerant. This is especially important if you want to use third party smart hosts as secondary SMTP servers for your domain. If you host your own DNS services and your DNS server becomes unavailable, then Internet SMTP servers won’t be able to find your Exchange Server. We will use the public domain name msfirewall.org in this series of articles, so we’ll enter that name in the E-mail domain name text box and click Next. On this page you configure the Exchange Server to remove e-mail attachments of your choice. Select the attachments you want the Exchange Server to prevent and if you want those attachments to be saved to a folder for later inspection. In this example we’ll block all the defaults and not save the attachments. Click Next. 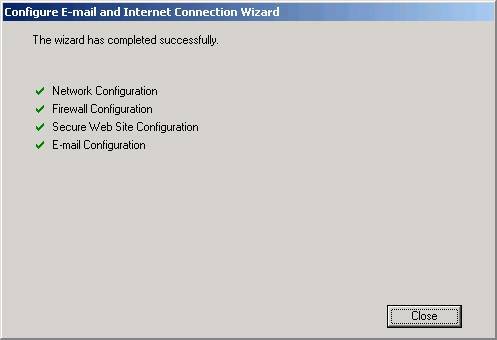 The Completing the Configure E-mail and Internal Connection Wizard page provides you with a print out of the settings you configured throughout the wizard. Right click in the frame with the information and click Select All. Then right click again on the selected content and click Copy. Copy the information to Notepad or Word or whatever your favorite text editor is. Then click Finish. 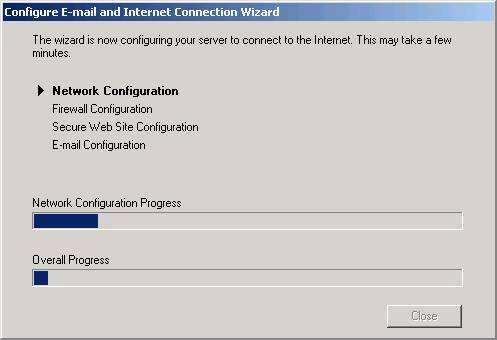 The print out from the Completing the Configure E-mail and Internet Connection Wizard appears below. 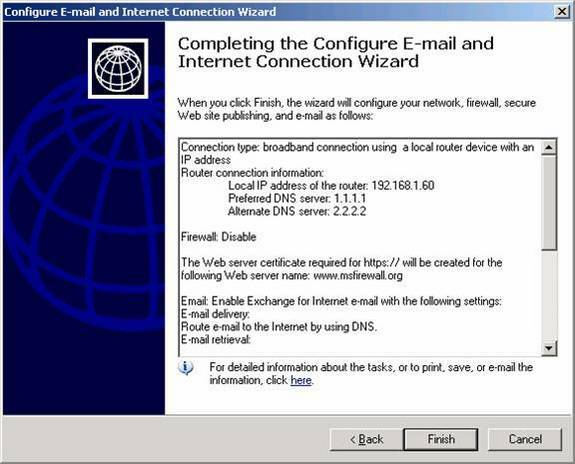 Route e-mail to the Internet by using DNS. Use Exchange to retrieve SMTP e-mail. Route e-mail from the Internet directly to Exchange. Registered Internet e-mail domain name: msfirewall.org. 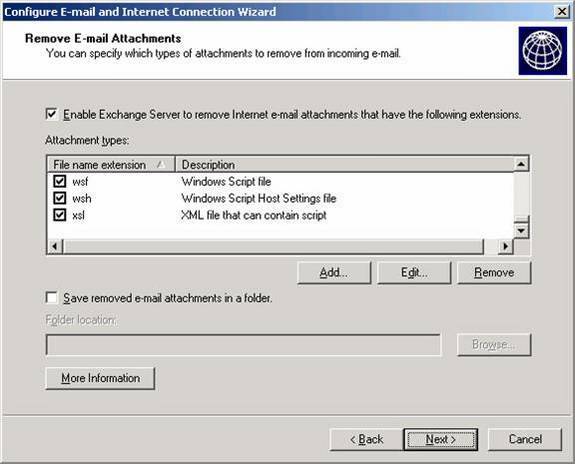 E-mail attachments: Remove e-mail attachments from Internet e-mail as specified in the wizard. For more detailed information about the configurations performed by this wizard, click the link at the bottom of this page to open Icwdetails.htm in C:\Program Files\Microsoft Windows Small Business Server\Networking\Icw. Note: each time the Configure E-mail and Internet Connection Wizard is run, a new .htm file is automatically generated to preserve the previous settings. For example, Icwdetails1.htm, Icwdetails2.htm, and so on. The next two figures show the completion of the CEICW process. In this four part series on the CEICW process, we went over each of the CEICW page and expanded on the options and meaning and implications of these options. I presented my view of networking and e-mail management best practices and provided a detailed rationale for those decisions. This series was not meant to be a comprehensive review of the CEICW, and there are many options that weren’t considered or were dismissed as poor choices from either a performance, security or reliability point of view. In the next collection of documents in this series we'll go over the tweaks needed on the SBS server in order to bring it up to common networking standards. We’ll take a look at the DNS settings and reconfigure them, although we’ll have to go through the process again after installing the ISA firewall software, which is something I didn’t realize when I first ran the CEICW. While it took longer to do it this way then if I did things right in the first place, I learned a lot along the way and I hope you’ll benefit from a shared learning experience. We’ll also go over the certificate infrastructure created by the CEICW and point out some interesting differences between how SBS does things and how I’m used to doing things. See you soon! –Tom.